There was late drama at The Showgrounds as Coleraine came out on top against reigning champions Linfield. With the game tightly poised at 1-1 Coleraine launched one last attack. Joe McCready's clever pass set Jamie McGonigle clear, he shot past Roy Carroll and as the ball headed towards goal Josh Robinson raced back and attempted to clear. Referee Arnold Hunter awarded the goal on the advice of his assistant, Linfield protested and Coleraine celebrated! To be fair to the Bannsiders they were the better team on the day and kept battling to the very end to move five points clear at the top of the league. 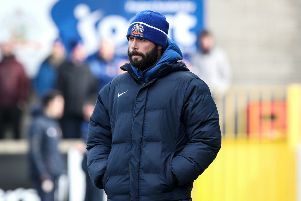 They were also without the injured Eoin Bradley and suspended Josh Carson, and they lost Brad Lyons with 15 minutes to go after putting Coleraine in front. It was a tight first half as both teams sized each other up. Jamie McGonigle forced Carroll into a save on 26 minutes, while at the other end Niall Quinn tested Chris Johns with a curling free kick. Referee Arnold Hunter was called into making a big decision as half time loomed. Andy Waterworth escaped the clutches of Stephen O'Donnell, before the defender clipped his heels on the edge of the area. Linfield were calling for a red card for O'Donnell, but after consulting with his assistant Hunter only produced a yellow as he believed Adam Mullan was covering. The game livened up after the break and Coleraine broke the deadlock ten minutes after the restart. Ciaron Harkin delivered an excellent ball into the box which Lyons headed past Carroll. The lead lasted nine minutes as the Blues drew level in similar fashion - Mark Haughey powering a header past Johns from Kirk Millar's corner. It looked as though the game was heading towards a draw before the late drama. Linfield's frustrations got the better of them after McGonigle's goal as boss David Healy was sent to the stands after the referee.